Ever since he was a kid, Ketch Secor was obsessed with old-time country music. In fact, he made a career of it. He's the leader of a string band from Nashville - "Old Crow Medicine Show." OLD CROW MEDICINE SHOW: (Singing) I'm going to sing and jump and shout, going to blow the windows out. KETCH SECOR: You know, this place that the band came from, Appalachia - east Tennessee, West North Carolina border - was such a wellspring of knowledge and inspiration. I feel that I could spend the rest of my life reflecting upon what I learned when Old Crow went to our sort of hillbilly boot camp in 1999. OLD CROW MEDICINE SHOW: (Singing) I'm going to shout my mountain music all night long. GREENE: But Ketch was not just inspired musically. Now he has written a new children's book. It is called "Lorraine: The Girl Who Sang The Storm Away." SECOR: This is an Appalachian folk tale with a couple of personal twists. SECOR: (Reading) On a Tennessee farm, where the music grows wild, lived a pitchfork and Pa Paw and his fearless grandchild. Oh, the ruckus they raised when the workday grew dark, with Lorraine on her whistle and Pa Paw on his harp. GREENE: Ketch reading some of his book for us there. So Lorraine is a little girl, and she loves playing music with her grandpa - or Pa Paw. SECOR: (Reading) The songs they sang always lifted their spirits. On good days or bad, it was joyful to hear it. GREENE: Joyful until a crow got involved. SECOR: Well, this mischievous crow, he likes to visit the farm. And suddenly they notice things go missing. GREENE: Namely their musical instruments. SECOR: Right. So the crow pinches them. GREENE: And so there they are with no instruments when a big storm suddenly rolls through. 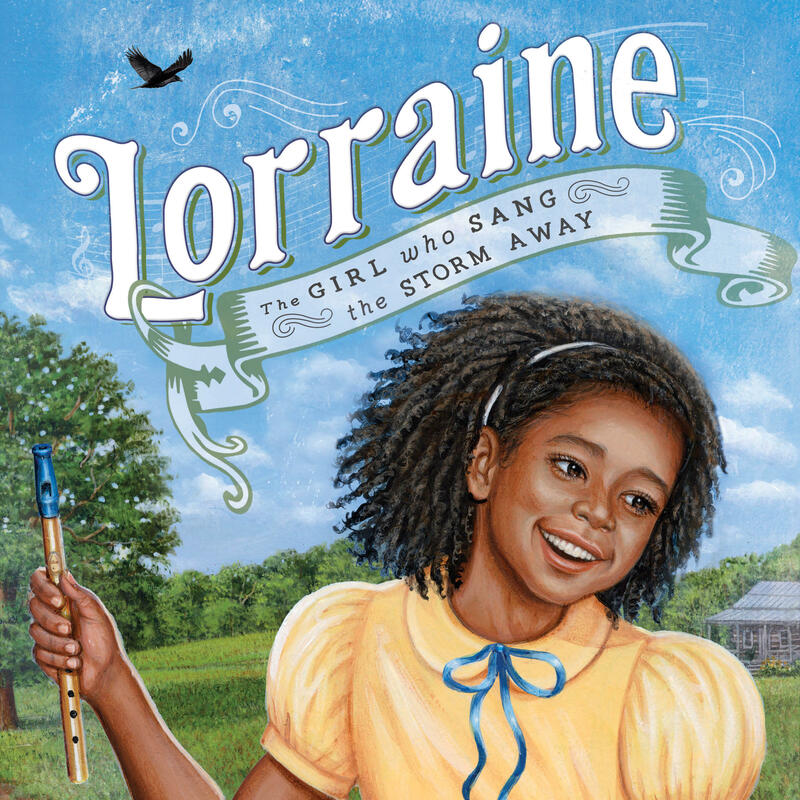 Lorraine rain really scared until Pa Paw Hall reminds her that she has the music inside of her. SECOR: They start singing. They find the voice within that pacifies them and makes the storm seem a little less frightening. 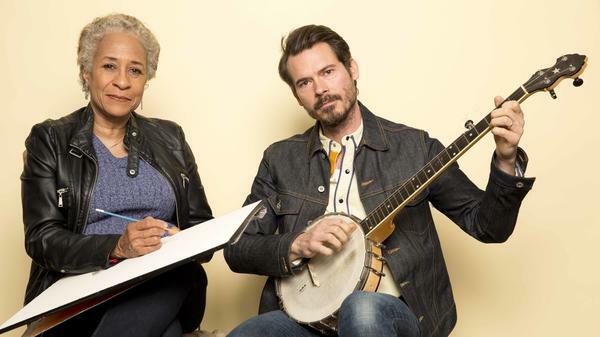 GREENE: And, you know, Ketch, when I thought about that, are you basically telling the story of the blues - this music where you'd have people with nothing, or close to nothing, looking to music within themselves when times are at their toughest? SECOR: Well, I know for me that in my darkest hour there's always been a song that has helped me to transcend. And certainly the story of country music and the story of the blues, which are really one and the same - the story of hard-working and oftentimes impoverished people looking for that boat across dark waters. GREENE: You chose to make your characters African-American in the illustrations in this book. Where and why was that decision made? SECOR: When I first heard this story, I heard it from a woman of Cherokee descent, a woman named Lorraine. She had a pet crow when she was a kid on her dad's farm. And this crow used to steal everything and bury it all around the farm, and they'd find little bits of string or cellophane or tin foil. So in my mind, Lorraine was a hillbilly girl of Cherokee descent. Now, it took a long time to get this book finished. But really the big part of the time was getting it published and then finding an illustrator. And it wasn't until maybe four years passed before the publisher said, sorry, Ketch, we can't really find the right illustrator. Would you like to search? And I found on the listing of a local art college Higgins Bond here in Nashville. Higgins is a really important childrens illustrator in the 1970s and '80s and then stops working for a long time. Higgins is the reason that Lorraine is African-American because Higgins is African-American. In fact, she's the first African-American woman to design a U.S. postage stamp. GREENE: I was talking to the actress Viola Davis recently about a children's book that she's done. She was saying two things. One is there is an incredible need for characters of color in children's books. It's been a void that's existed for a very long time. She also says she loves when you have, say, characters of color, but there doesn't have to be some explanation or reason for it. What do you think of that? Is that something we're seeing in your book? SECOR: Yes. And the thing that was missing - and really waited until I discovered Higgins Bond - is that I really wanted Lorraine to be an African-American girl. You know, I do a lot of volunteer work around communities of color. And in one of the places where I'm often reading, a literacy and mentorship program for kids, I'll read any number of books. With this book, I have the opportunity to now read a story in which the characters look like the audience. GREENE: I'm interested in your volunteering. And I know you also helped found a private school in Nashville, right? I mean, it sounds like your commitment to education is part of where this children's book came from. SECOR: Yeah, they all sort of come around the same forces to draw up for me this passion about education. As a kid, I lived in all of these different towns - five towns by the fifth grade. My parents were educators. So it turned out that I had it in me to start a school. And then these kind of volunteer gigs really helped me to say, oh, I think I could see a school in this parking lot by the shores of this rushing interstate with the two expressways spurs and the Shoney's and the wig shop. That parking lot has got a school growing in it. We just need to plant the seeds. GREENE: Is that where you put the school? Is it by a wig shop and a Shoney's? SECOR: Yeah. What better place to put the newest Episcopal school in the nation? GREENE: I love it. Was this a different experience - writing a book compared to writing a song? SECOR: I think writing songs and writing a children's book are really kind of one in the same. You want to get a tag line or a refrain. You want to have language that's easy to remember. There's a singsong quality to this book. It's in iambic pentameter. GREENE: It makes me want to ask you - and I don't know if you'd be comfortable or not - but if - would you sing a page of the book, like even the ending if that's something - I don't know if you've thought about putting it to music. SECOR: Well, I'd love to. I hadn't. Let's see. What should our melody be? GREENE: I'm going to leave that up to you. You're the expert. SECOR: Oh, man. (Singing) They broke into song with their hearts all aglow. When caw, caw, caw came the voice of the crow. He was perched on the stump of the old janky (ph) pin, dancing a jig with a mischievous grin. Then the clouds parted ways as the music rose high, and the sunshine sparkled in the Tennessee sky. GREENE: Wow. What better way to go out than that? Ketch, it is always such a pleasure talking to you. And best of luck with this new journey in this children's book. SECOR: Hey, thank you, David. Peace. GREENE: Ketch Secor, children's author, also lead man in Old Crow Medicine Show - the band probably best known for this. OLD CROW MEDICINE SHOW: (Singing) So rock me, mama, like a wagon wheel. Rock me, mama, anyway you feel. Hey, mama, rock me. Transcript provided by NPR, Copyright NPR.